A Doppelgänger, which in German means “double walker,” is a double or a duplicate. In folklore, it’s a ghostly replica of another person whose appearance is a harbinger of death. In the stock market, it’s a harbinger of market crashes and financial death. I’ve been following the similarities between the 2007 and 2011 markets since May [for a chronology, see OMG, WTF and Money Back Guarantees.] The similarities in both price and time have been astounding. For the uninitiated, here’s a quick snapshot. Of course, the relevant question when SPX is off over 200 points is “what’s next?” In my opinion, the near term is to at least 1070, possibly as soon as tomorrow. Take a look at the past five years, and a very interesting channel that’s developed. 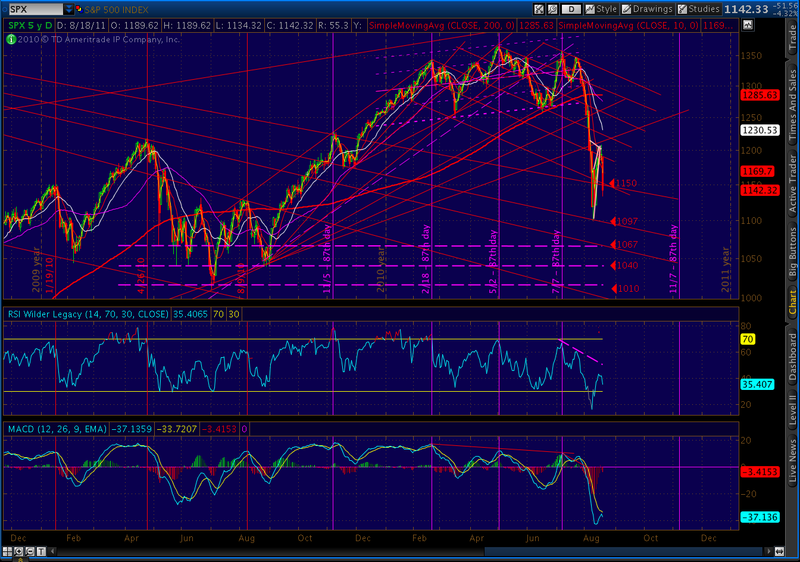 Note also that the comparable 1/23/08 low lined up with a large dip in March 2007. The equivalent dip in the past year, of course, was April – August 2010. 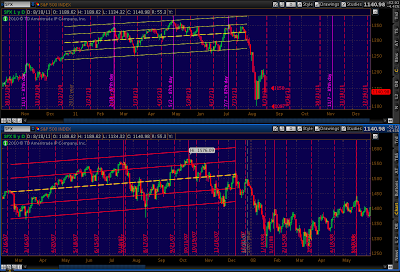 It just so happens to coincide nicely with the upper channel line from the chart above. That line, BTW, is actually a fan line since it originates at the 10/11/2007 high. 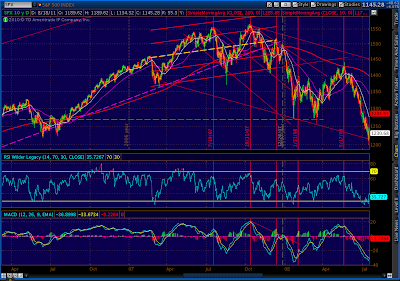 It touches the Apr 26 2010 high on its way to 1067 (today’s value.) Other potentially relevant fan lines are marked as well. Note, for instance, that we initially stalled this morning at the fan line touching the Nov 5, 2010 high — a miniature copycat of the Apr-Aug 2010 pattern. I’ve also marked relevant horizontal support trend lines from that pattern, which is fast becoming the more relevant touchstone for the market’s present direction. 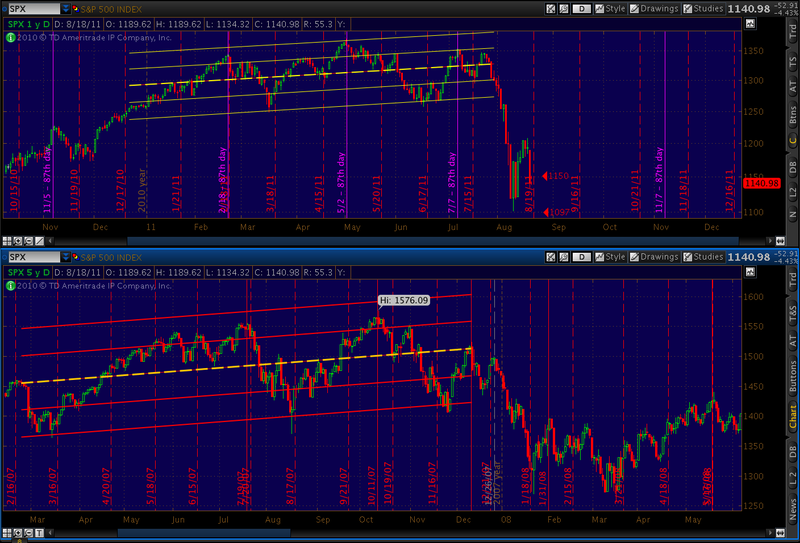 One caveat: since this is a P rather than a P down, we can expect to see anomalies develop in the 2007/2011 comparison. 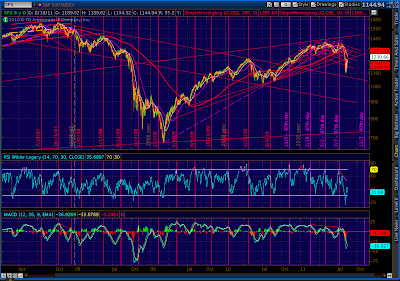 We’ve already seen one big one, with a wave 3 down that greatly exceeded its 2008 equivalent in price. 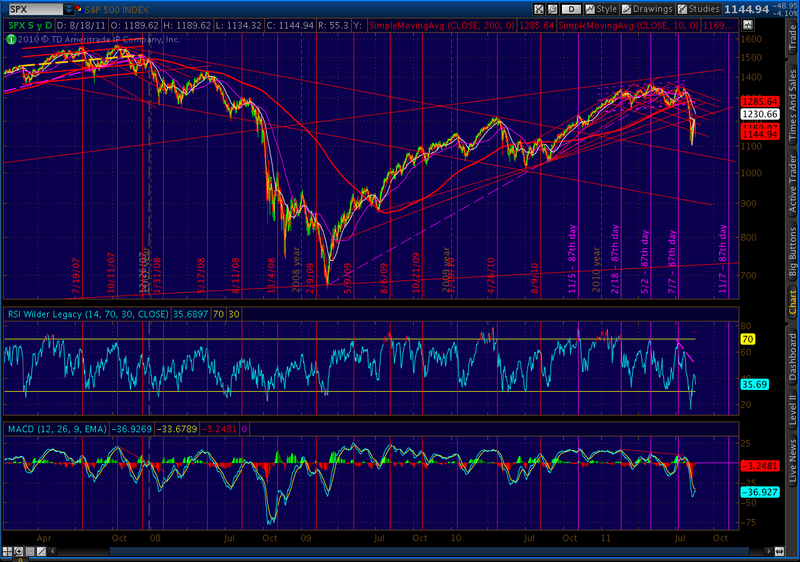 It wouldn’t surprise me if the current wave 5 was similarly larger in comparison to its 2008 equivalent. After the bounce, then what? Again, since this is P and not P, the ultimate decline will be greater than in 2008-2009, which was a mere 900 point drop in the S&P; 500 and 7,700 points on the Dow. From a macroeconomic standpoint, there’s ample evidence that this economy is just as troublesome as 2007’s. Morgan Stanley may have finally acknowledged it, but the trend has been obvious for months. Unemployment, plunging consumer confidence and an increase in underwater real estate will prevent any meaningful recovery. Debt continues to be the key. The headlines are the same as 2007; only the names are different. Instead of Lehman, Bear and AIG we have Greece, Ireland and Italy — not to mention a whole boatload of banks that still haven’t dealt with their bad loans and face increasing litigation risk. Can a crash be averted? Thanks to Texas Gov. Rick Perry and inflation headlines, Bernanke is unlikely to get off another round of QE. And, there’s rising acknowledgement that QE really only helped Wall Street. The bottom line — this time we’ll complete the crash that QE prevented the first time around — a crash that will have investors wishing there were no such things as ghosts. USA is currently undergoing a Saturn Return, in layman parlor, it means a period of contractions. 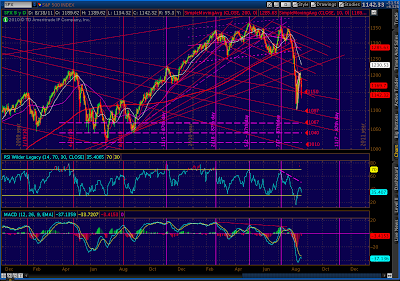 Thus I expect the USA' influences to be contracted including its stock markets. Yesterday, Sun opposition to the USA moon, triggered the fears in the people and the sell offs in the markets. The moon in Aries also weighed in and triggered the Mars/Uranus/Pluto T square energy. Currently Saturn is within 1 deg orb of the USA Saturn, which means its influence is in effect. Mars will be squaring to Saturn and USA Saturn next week as well, which to me means we can expect more sparks to stroke the markets ahead. 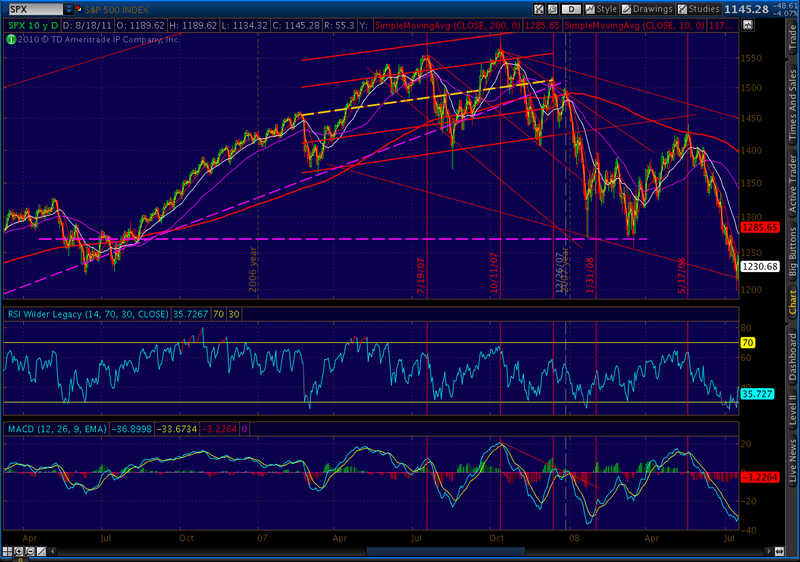 I've looked at the 2008 analog which proposed another 50% drop from its intermediate pause then. Basing on the same percentage(level) and pattern(time) projections, my calculation shows there is potential of another 50% drop from the 25 Jul 11 to make the 100% projection. The level is assessed to be around 890ish, around the 23 Aug 11. Do you see this possibility unfolding ?